I would like to mention community balance team about lack of text strings and prevent new issues in this area. Here will be listed founded issues. 1. String with name of the abillity. Used in the menu and during the battle. 2. String with description of the abillity. Used in the menu and during the battle. 3. String with yellow advice text. Used only in the game. 4. String with required commander points. 5. String with description of the unit on the botton of the screen. 6. String with yellow advice text on the botton of the screen. 7. String with name of the effect. 9. String with description of action on the botton right slot. 10. String with yellow advice text of action on the botton right slot. 11. String with name of the upgrade. 12. String with description of upgrade. 13. String with yellow advice text of upgrade. 14. String with requirements for upgrade. 1. 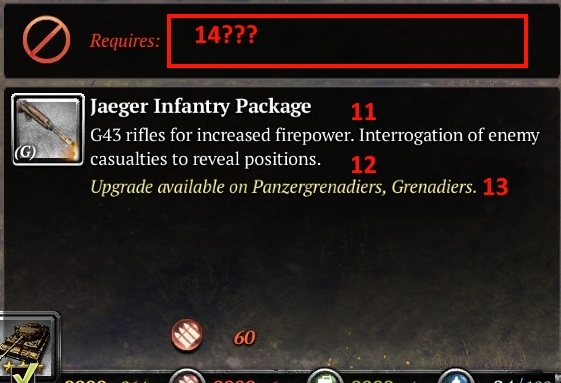 G43 upgrade for Panzergrenadiers doesn't have it's own string #12 and #14. 2. Shock troops, in the main menu, using guards string #3 for their string #2. 3. Artillery officer doesn't have it's own string for veterancy one. 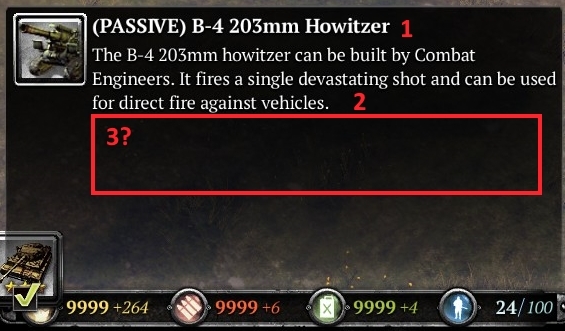 Because of that it's say about medkit istead of 120mm artillery barrage. 4. B-4 doesn't have string #3 at all. 5. Rangers doesn't have string #2 and used their string #5 for that. 6. Flamehetzer doesn't have string #2 and used it's string #5 for that. 7. Strumtiger doesn't have string #2 and used it's string #5 for that. 8. King Tiger doesn't have string #2 and used it's string #5 for that. 9. Riegel 43 doesn't have string #9 and used it's string #2 for that. 10. Soviet vehicle detection doesn't have string #8 and used it's string #2 for that. 11. British air resupply operation (which drop hmg and at gun) doesn't have string #8 and used it's string #2 for that. 12. Single DP-28 upgrade using string #12 from double DP-28 upgrade. 13. Penals using the same string #12 for PTRS-41 upgrade with guards single PTRS-41 upgrade. 15. Rangers and Paratroopers using the same string #12 for their Thompson upgrade. The problem is, that their upgrades have a difference. 16. Ostheer Hull down doesn't have string #9 and used it's string #2 for that. 17. 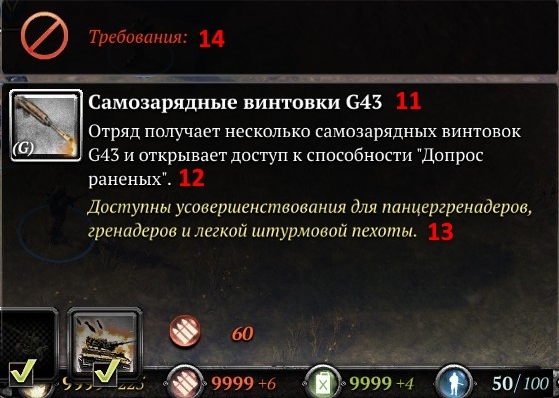 Guards don't have separate string for vet ability requirement and use string from vet 1 description instead. 19. 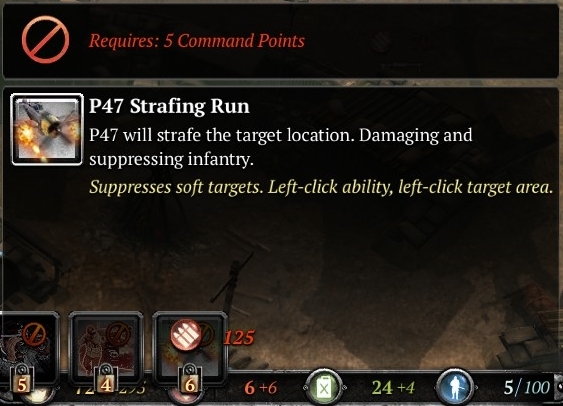 P-47 AI strafe run use the same string #4 with Valentine call-in. 20. KV-2 string #6 and IL-2 Sturmovik Attacks string #3 using the same string in localization file #11020682. 21. German bunker doesn't have string #6 at all. 22. Soviet and Wehrmacht base bunkers don't have string #6 at all, unlike their western counterparts. 23. M20 refers to string 11159445 (req for dispatch), which not added to locfile. It can be added manually. 24. M1 At-Gun refers to strings 11159444 (req for dispatch), which not added to locfile. It can be added manually. 25. Jaeger command squad using JLI's string #5 for itself. (iow unit description). 27. USF Combined Arms doesn't have string #8 (description for aura, when you look at it on unit's portrait) and using string #2 for it. 28. For the Vaterland doesn't have string #8 (description for aura, when you look at it on unit's portrait) and using string #2 for it. 29. 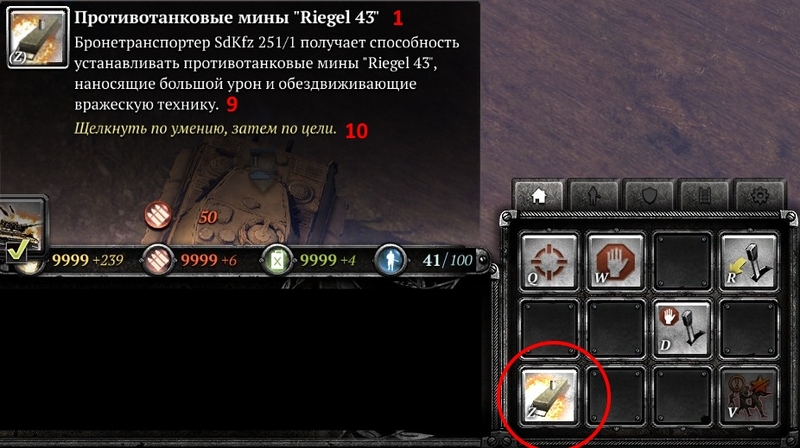 M1 AT-gun HVAP shells ability doesn't have string #8 (description for aura, when you look at it on unit's portrait) and using string #9 for it. 31. Flamehetzer doesn't have string #3 and used it's string #6 for that. 32. Planted POMZ-2 mine doesn't have string #6 at all. 33. Teller 43 doesn't have string #6 at all. 34. USF paratroopers and OKW Fallschirmjäger call-in abilities using the same string #3 for them. I hope this sysmem will help to give required number of text strings for every new commander abillities/units. P.S. 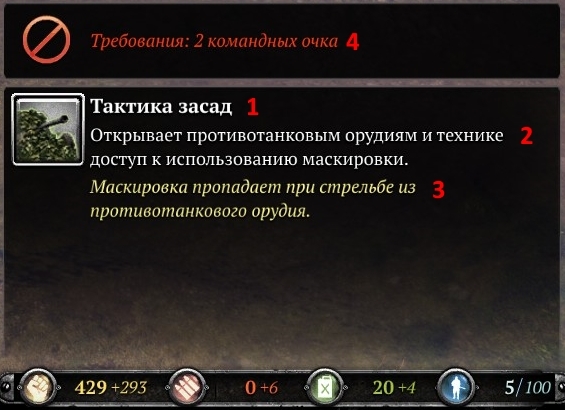 Sorry for screens in russian, because i screened these issues during my work with big update for russian localization mod. I'm almost 100% positive that non english localization was completely abandoned when modders too over balance, so unless you are using english, don't expect any updated loca keys. It is more about coded string for every situation. It match for all languages. I will doublecheck it for english as well. Edit: i was right, it is coded issue and match for all languages. P.S. I am not talking about outdated text inside of strings, because it can be fixed by me or everybody else. I am talking about coding to use proper strings, or creating them. 15.1. I hope cavarly riflemen will use separate string #12 for their Thompson upgrade, because their upgrade has a difference too. P.S. Later, i will try to add # of string in locfile for previous issues. It can be fixed manually by adding this string. 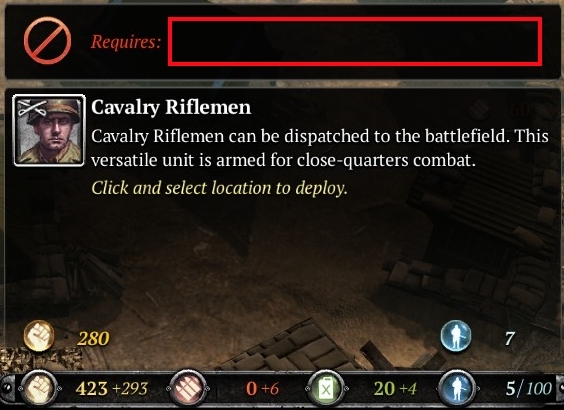 Usually this string contain something like "New unit available - "Name of the unit". Click to dispatch. Effective vs. something"